Designed specifically for handling bulk containers with nylon loops in each corner. Constructed of tubing for smooth surface with no sharp edges. Easily attach to load with open lifting lugs. Lug spacing will hold up to a 3” wide loop. Oversized lifting eye to accept a wide range of hooks. These standard configurations cover a wide range of requirement for many multi-point lifting applications. Swivel hooks with latches standard. Adjustable spreads on 1' increments. Faspins for easy crossarm adjustment. OPTION A MULTIPLE BAILS - Use 2 hoists to increase lifting stability. OPTION B ADJUSTABLE BAIL - Is used when load-leveling capability is required along length of load. OPTION C ADJUSTABLE SPREAD - Use when adjustability in length and width is required. A specially designed lifting and rotating beam using two cranes or two hoists to horizontally rotate a load. A position locking pin holds the load rotation at a designated position. Available with motorized rotation. OPTION A - TWIN HOOKS: Used in conjunction with basket hitch slings. OPTION C - MOTORIZED ROTATION: Allows remote positioning of a load. 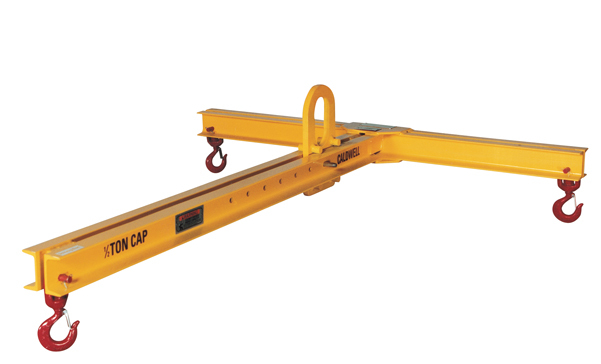 OPTION D - LOWER HEADROOM BAILS: Utilized when headroom must be held to a minimum. Crane hook data must be supplied. Maximum 20 feet (upper and lower) beam length. Designed to efficiently handle standard chlorine gas cylinders. Standard size determined by the Chlorine Institute is 80-3/4” to 82-1/4” in length. Special low headroom modification is available.